A recent report released by the U.S. Public Interest Research Group finds that “a six decade-long period of steady increases in per-capita driving in the United States is over”. Furthermore, this downward trend is due in large part to the driving-aversion of Millennials—people born between 1983 and 2000. “Young people aged 16 to 34 drove 23 percent fewer miles on average in 2009 than they did in 2001—a greater decline in driving than any other age group.” And a 2011 study by the University of Michigan found that only 22 percent of drivers are 20-somethings or teenagers, down from a third in 1983. A parallel trend is the rise of the cargo bike. Cargo bike use has increased dramatically in Europe, and the U.S. seems poised for a similar explosion. A Next City article reports that “Functional and Economical, Cargo Bikes [Are] On the Rise“. The author describes how “these bikes are popular in Denmark and Holland. The company Copenhagenize estimated in 2009 that 6 percent of households in Copenhagen owned at least one cargo bike, which comes out to roughly 30,000 cargo bikes in the Danish capital. The rest of Europe is catching on, too.” Is the U.S. also adopting cargo bikes? The blog Transportland (which incidentally is similar to this blog in tone and purpose) tells us, predictably, that “Cargo bikes are no longer an oddity on the streets of Portland.” They describe how Portland’s cargo bike infrastructure has evolved beyond merely selling cargo bikes, into manufacturing accessories and even designing and building cargo bikes. A few other areas in the U.S. appear to be following Portland’s lead, notably Minneapolis. How can we encourage this carless trend on a personal scale? We need to support the Millenials we know who choose not to drive. For me that starts with my teenage kids. I feel lucky that my own kids prefer to bike and walk to school. When I was a teenager I was desperate to get my driver’s license. My 17-year-old son, in contrast, is ambivalent. I’m not exactly sure why. The PIRG report speculates that one reason Millenials drive less is due to “mobile Internet-connected technolo­gies…shifting the way young Americans relate to one another, creating new avenues for living connected, vibrant lives that are less reliant on driving.” Right on Millenials! The PIRG study shows that we need to tear ourselves away from our assumptions about what kinds of transportation teenagers and 20-somethings want. 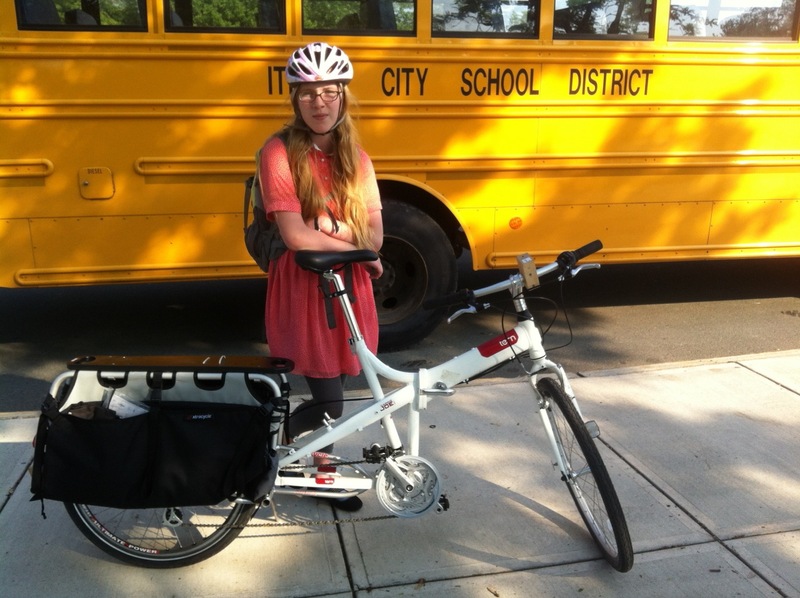 Cargo bikes can empower teens with mobility years before they can get a driver’s license. They can empower young professionals with practical transportation years before they can afford a car. Millenials no longer consider a bike as a toy or an exercise machine tangential to their transportation needs: electric cargo bikes can carry friends; they can haul stuff; they can go long distances. A thirteen-year-old with an electric cargo bike can enjoy as much independence as an eighteen-year-old with a car. We might ask “Why give a teen a cargo bike rather than a regular bike?” This question reflects assumptions about the purpose of a cargo bike. Isn’t it supposed to be used to transport commercial goods? Objectively a cargo bike is simply a lightweight, narrow and slow vehicle that can carry more than a bicycle but less than a car. How much stuff do teens need to carry? I would argue they need to carry more than a bicycle but less than a car. We might ask “Why should someone carry around the extra weight of a cargo vehicle when they only occasionally need to carry more than their own body?” We should ask this question of motorists! The answer is that cargo bike technology has advanced to the point that cargo bikes do not weigh that much more than regular bikes. An article in the Guardian observes that “In order for your cargo bike to even stand a chance of becoming your default bike, it needs to be an attractive riding option – that means it must be relatively light. Sadly, most two-wheeled front loader cargo bikes up until a few years ago tended to tip the scales at a tiring 35 kilos [77 pounds], even when empty.” This is almost twice what an average mountain bike weighs. They continue “Enter the Bullitt. Conceived a few years back by two Danish frame designers and introduced in 2008, it was the first mass-produced aluminium cargo frame. The fork is necessarily of steel, but it comes in at 20-24 kilos [44-53 pounds]. Modern cargo bikes are not only lighter, electric motors give them new utility approaching that of a (somewhat slow) car. As a parent I like the idea of giving my teens a somewhat slow car. I like the idea of many more somewhat slow cars on the road. Let me reinforce this idea: the electric cargo bike is a completely new kind of vehicle. The name “electric cargo bike” reflects its heritage, not its future. We don’t call a car a “horseless carriage” anymore. We don’t call it an “internal combustion engine passenger and cargo vehicle”. We call it a car. I predict that by the end of the decade the electric cargo bike will have a similar short name. We might also challenge another assumption: “Aren’t cargo bikes only for young families with kids?” The vast majority of cargo bike photos show parents transporting kids. While that is certainly a great use for cargo bikes, I would like to see us as a society encourage all age groups to use electric cargo bikes. The cargo bike revolution is going to happen because the youngest among us receive a cargo bike for their thirteenth birthday rather than a car for their seventeenth birthday. One of my Millenials gets a ride to school on the new Cargo Joe cargo bike.